Hammerpoint Interactive's goal right now is to clear up all support and refund requests for Steam users. 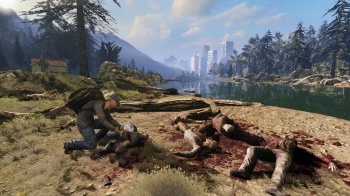 "We completely understand that players were upset and felt that we mislead them," said Hammerpoint Interactive's Sergey Titov, whose zombie game The War Z opened so disastrously that Valve was forced to step in and shut it down. "We absolutely take responsibility for these inconsistencies," Titov went on to say, and promised that Hammerpoint's goal right now is to clear up all support tickets and refund requests for Steam users. Titov, in an interview with PC Gamer, said he completely understood, and respected, Valve's decision to close down Steam sales. Valve has to think about its customers first and foremost, and Titov was in complete agreement with Valve's position. Titov blamed ineffective communication with the Steam community, and a "major disconnect" between the development and marketing teams - which resulted in 'coming soon' features being listed as current - for the debacle, but said that the responsibility was Hammerpoint's. "We will be making some changes in our structure and with some of our key team members," Titov said, when talking about responsibility, and what would happen next. The full text of the interview can be found here. "We really hope that those players will understand that we weren't looking to intentionally mislead anyone," Titov concluded. "I personally hope that they will give the game another look and find that it actually is worth the purchase." That may be too much to hope for; only time will tell.